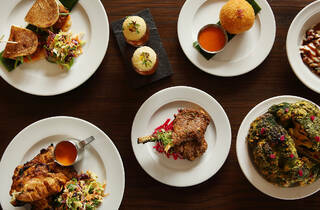 A second outing for the Indian small-plates restaurant. 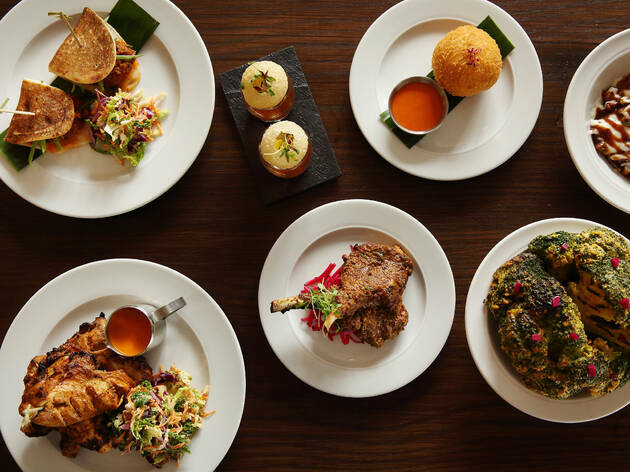 Sitting glamorously beside Tower Bridge, this is the second branch of Gunpowder, the home-style Indian sharing-plates joint. Split over two floors, this riverside spot is much bigger than the Spitalfields original, and it has a more stylish, contemporary design (polished marble floors, vintage red leather seating), jazzily offset by a soundtrack of old-school Indian tracks. Better yet, on the midweek night of our visit, it was buzzing. Head chef Nirmal Save has introduced new dishes here, like intriguing-sounding grilled black oysters. But the most impressive newbie was the duck leg. A hunk of tender meat arrived slathered in a sweet and spicy tomato sambal, with crisp parsnip ribbons for the contrast of sweetness and crunch. There were also quirky new puds, like paneer-and-Oreo cheesecake (rich, creamy, with big biscuit chunks) or Old Monk rum baba: a moist syrup- and booze-soaked cake loaded with cream and fruit. But keep an eye out for signature dishes. The seared head of broccoli, bathed in a creamy, tangy sauce, is a must. As is the succulent grilled tandoori chicken. And for a welcome respite from the heat of those dishes, order the pretty aloo chaat (chickpeas and potatoes with a sour-salty spice mix and yoghurt). 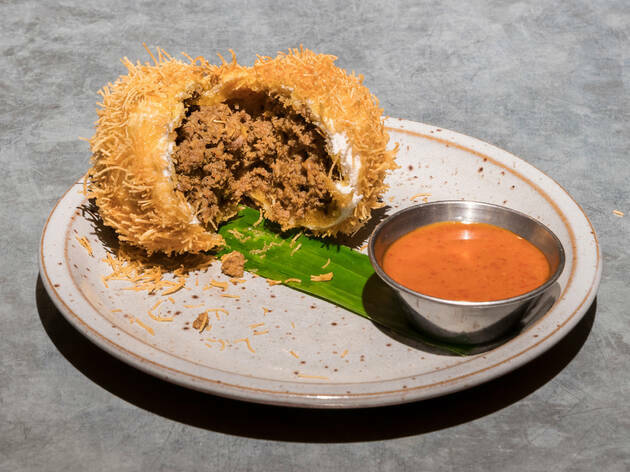 The duo behind Gunpowder closed down their other restaurants, Gul & Sepoy and Madame D, to focus on this spin-off and it’s paid off, not just in the food and setting, but in the swift, welcoming service. Tower Bridge: you’ve finally got the destination restaurant you’ve been waiting for. Dinner for two with drinks and service: around £95. Gunpowder is just delicious. Great ambience, simple decor, good and efficient service. The massala eggs were great, the broccoli was interesting, the lamb chops were so delicious but the real winner was the aloo chaat! I'm going to go back and have a bowl of this for myself. They also offer a great selection of drinks and cocktail specials - I had the gin cocktail with the ginger and was seriously good! Gunpowder has become one of my favourite Indian restaurants and I can't wait to go back! This menu packs a punch along with the variety of cocktails which all have their own unique spiced twist. The highlight for me was the ever so tender Maa’s Kashmiri lamb chops. The Gunpowder Aloo Chat shouldn’t be missed either. I enjoyed a refreshing Bellini spiced with mango and chilli that kept my tastebuds guessing. This is definitely one to check out and having been to India I sure wasn’t disappointed by the menu! I loved Gunpowder and their delicious options of Indian style tapas dishes, all packed full of flavour and spices! Everything I had was very tasty but what I would go back for any day was their delicious Aloo Chaat - a must-order if you visit! Apart from that we had a grilled mustard broccoli with masala sauce and eggs masala - both were very flavourful with just enough heat and great kick of spices! I love the sharing plate concept, the atmosphere in there is great, the smells are just incredible and the staff very friendly and attentive. Such a great meal! Explosive tastes with a modern twist of the classic Indian food. A must try. 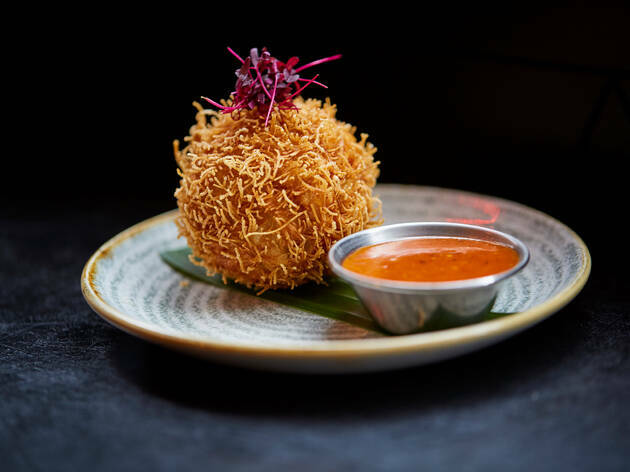 Gunpowder has to be one of my favourite Indian restaurants in London and I am so happy that one has opened at the new one tower bridge development. Compared to their original restaurant in Spitafields, which is pretty cosy the new restaurant is much more spacious and can can seat a lot more people (this mean a lot less waiting time for a table). The food is amazing... I tried egg masala for the first time and I have to say I was a bit apprehensive about this dish, but it was extremely tasty and has a nice little kick too! 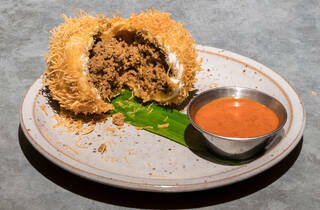 Gunpowder has been a favourite since they opened their first restaurant in Spitalfields. This new branch offers mostly the same menu but has a much bigger space. 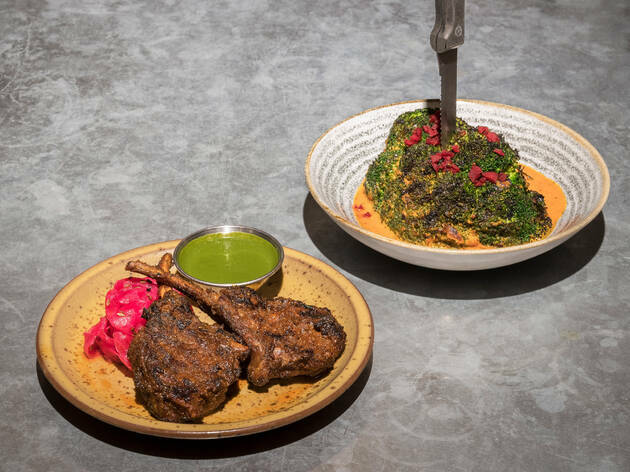 My favourite still has to be the Kashmiri Lamb Chops, so tender and packed full of lovely flavours. One dish that’s new here is the Chicken Madras Lollipops which was also a winner! Definitely a great addition to the new One Tower Bridge development. The only thing that’s lacking is a more developed dessert selection. I really enjoyed my visit to Gunpowder at One Tower Bridge! It’s tapas style Indian food with so many quirky and delicious options to choose from! My absolute winner of the night was their gunpowder aloo chaat which is a must order. The only thing I felt that let them down was their cocktails. Mine was just too spicy and not very pretty. Overall though, I would definitely go back! An offshoot of the Shoreditch original, the new Gunpowder restaurant in the newly opened One Tower Bridge complex is well worth a visit! The staff were friendly, the tapas style Indian plates packed a punch and the atmosphere would suit any occasion from an intimate date to a rowdy team lunch. Big props to the aloo chat which was just divine! Love this restaurant. Great cocktails with an Indian twist and amazing modern Indian food. The egg curry masala was quite spicy but so flavourful. Grilled mustard broccoli with masala sauce was surprisingly good, it's hard to make broccoli really shine but they did a great job. Maa’s Kashmiri lamb chops were the standout, super tender and perfectly spiced. Really liked gunpowder, i wouldn't necessary say its authentic indian, as its mostly catered for the westerners. Nonetheless, some real good dishes, and a nice quirky place in its own kind. Started off with one of their cocktails, Pani Puri Magaharita - spicy tamarind, tequilla and chilli. I quite enjoyed it, although to me it tasted like a chutney, which you pour over the pani puri and eat it all at once. The food plates came out one by one starting with peanut and flat chickpea chaat, egg curry masala, maa’s kashmiri lamb chops and sigree grilled mustard broccoli. My favourite by far was the sigree grilled mustard brocolli, i liked the chariness of it, and it really brought out the earthy flavours. I also really enjoyed the lamb chops, they were cooked to perfection. My least favourite was the egg curry masala, it was a tad too salty for me. Aloo chaat is aloo chaat, you can't really mess that one up to be fair! I think I have a new favourite Indian restaurant in London! Wow! Even though I didn't get to try as many dishes as I would have liked, I absolutely enjoyed the ones that I tried. The Gunpowder aloo chaat was extremely delicious and so addictive that you could easily eat a large dish of it. The broccoli, oh God the broccoli... I actually didn't know these are sort of their "signature dish". But I personally believe it was the tastiest broccoli I've ever had in my life! The cocktails are also very interesting! Very innovative and different! I had the pani puri margarita and I admit I've never had anything like it before! Not going to lie, the first sip was quite unusual, but then I got used to it and actually started liking it. I highly recommend this restaurant! I really recommend Gunpowder for a selection of quirky, thought-through, reasonably priced and delicious Indian tapas. Start with one of their cocktails, interesting takes on your average recipes: you'll want to drink no other Bellini after you've tried their mango and chili Kitty Party Bellini! Start with the spicier dishes - the light and yummy egg curry masala and the sigree grilled mustard broccoli, together with the exquisitely tender maa’s kashmiri lamb chops - and finish off with the peanut and flat chickpea chaat, a much needed sweet and sour palate cleanser after all that spice. You can't miss out on Gunpowder for dates or group dinners! a new tapas style Indian restaurant running its soft launch for the whole of August. I was curious about the broccoli which costs £12 for a whole or £6 for half. Enquired staff about this but he just recited the description on the menu. It arrived with a knife stabbed through, but overall anticlimactic as I failed to see why this broccoli was so special even at the 50% off price. The other dishes made up for it though. 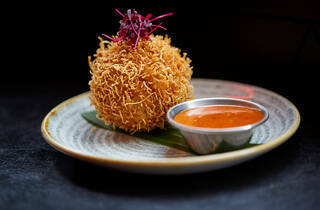 #LollipopChicken succulent with crispy fried skin and sauce. #SoftShellCrab was very well done. #PorkRibs had an amazing glaze. #LambChops tender and seasoned perfectly. I prefer this place to Dishooms to be honest and other than the brocoli, prices weren't too bad. Staff said dishes were spicy so I was actually a bit scared as I can't handle my spice at all! But I barely felt the heat. It had the right amount of spices and was delicious. I visited here with a friend for lunch during their soft launch. The food was really good and I loved that because the plates were small you could try a bit of everything. The two chicken dishes were especially good. There are a few teething problems with service as we didn’t end up getting one of our dishes but overall we had a lovely lunch. Only thing is that I think it would be very expensive without the 50% off. I didn't think I'd find a place to top dishoom and make me forget my own name but gunpowder did... Their okra fries were sliced very thinly and small which I actually prefer over the normal big chunks most restaurants serve. We had almost every dish on the menu there and I can say honestly that everything was very well flavoured! Their soft shell crab was delicious... The chicken masala lollipops were to die for and the rabbit pilau was sensational... I practically rolled out of there! Highly recommended and to boot they weren't too spicy which I was very gracious for. 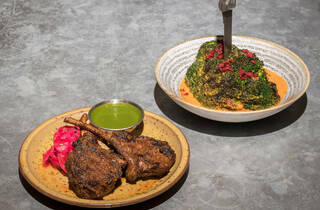 After having my best Indian ever in its older sister in Aldgate, I was longing for trying out the new Gunpowder, especially after reading the sad news that Gul and Sepoy closed down. Similarly, here they also serve small plates to share and they arrive in the order of their readiness. The beetroot and lentil salad was a mountain of unwashed cress with sand or soil bits clearly detectable. It was nicely spiced, but out of the two main ingredients, only beetroot was present, entire 4 slices halved. They tasted like the ones you buy ready cooked in the supermarket, not much flavour. Orange and ginger dressing translated into one tiny chunk of orange. For £8 a serving, a bit overprices for a bowl of greenery. But that wasn’t the worst. The second most expensive dish on the menu is a small grilled broccoli, served with a bit of red sauce. Tasty, but the price is definitely not justifiable. Battered okra fries, cut into quarters were too fried and dry for my liking. The deep fried crab had a nice big crisp and aroma, it worked well with the punchy spicy and sour tamarind sauce. Paneer in spinach sauce was tender but under-seasoned, still one of the better dished we tried. It’s a sleek, modern space with comfy booths and plenty of tables. The space near the bar cries for rearrangement as it’s hard to pass to the second floor/toilets if only one person is in the way. It’s their early days, let’s see how they go, for now, I’m not too impressed.